Eva is cheerful, romantic and positive. She runs an event and concierge business together with two friends and food is her specialty. When she gets the request to make a penthouse on 5th Avenue ready for Christmas she can't wait. She's supposed to stay there for a few days, so she can decorate the place and prepare meals for when the owner returns, which should be a nice surprise for him. However, when she arrives someone is still there. Lucas was supposed to be gone, but now Eva is stuck with him. Will she be able to survive this? Lucas is a successful crime writer who likes solitude. He told everyone he knows he'd be writing in Vermont, but he's actually still in New York and hasn't written a single word. Christmas has become a difficult time for him and even after several years he can't find a way to deal with his grief. He wants to be completely alone and the last thing he thinks he could use is an over-enthusiastic woman in his home. Eva can't leave though, so he has to deal with her company. Is it actually as bad as he thought it would be or is Eva's sunny outlook on life and her inability to hide her love for Christmas exactly what Lucas needs? Miracle on 5th Avenue is a fun Christmas story. I immediately liked Eva, she's got a lovely bubbly and energetic personality. She believes in true love, is always honest about her feelings and the way she sees the world is adorable. Lucas has a good heart, but he has a dark outlook on life, he could definitely use some of her lively spirit and I admired her determination to bring Christmas magic into his cold apartment. Eva manages to thaw the place and warm Lucas's heart, which is the exact right idea for a story about true love. Sarah Morgan has a nice heartwarming way with words. I like that she writes about friendship as well as love, she describes the meaningful things in life in an amazing way. I love all of her main characters, their personalities always stand out in a fabulous manner. Miracle on 5th Avenue is an endearing story filled with sparks and Christmas cheer. It's a lively Christmas fairytale with a wonderful cute ending. If you love big city romance combined with small country connections you will love Sarah Morgan's stories. 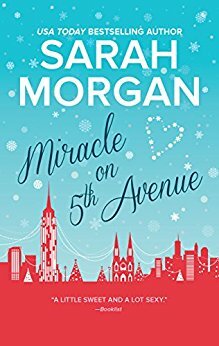 Miracle on 5th Avenue is the 3rd book in the From Manhattan with Love series, but can easily be read as a standalone. Nothing better than a Christmas love story! I think this will be fun to read. I have yet to read it, thank you. I've just watched 'Miracle on 34th Street' twice (the original with the marvellous Dickie Attenborough) and sobbed my eyes out! I should have had this to hand to continue the theme! I bet Eva & Lucas are able to bring out the best in each other. I love books with Christmas miracles!